The 113 black and yellow 1/2 inch compression coupling is a Fiskars brand product that works with the Mr. Soaker Hose brand 580 yellow stripe soaker hose and all Fiskars brand 1/2 inch soaker hoses including all 1/2 inch soaker hoses sold under the Moisture Master, Aquapore, and Better Homes and Gardens and Fiskars brands. Use the couplings to add an additional length of soaker hose to an existing line, connect a piece of poly pipe to your system in an area you do not want watered, repair breaks in a damaged segment of soaker hose or poly pipe, or attach one to the end of a soaker hose and screw on an end cap to the 3/4 inch hose threads to end a run. Now available individually or on sale in bags of 25. 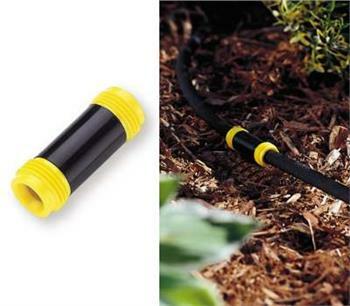 The 113 black and yellow 1/2 inch compression coupling is a Fiskars brand product that works with the Mr. Soaker Hose brand 580 yellow stripe soaker hose and all Fiskars brand 1/2 inch soaker hoses including all 1/2 inch soaker hoses sold under the Moisture Master, Aquapore, and Better Homes and Gardens and Fiskars brands. Use the coupling's internal compression fittings to add an additional length of soaker hose to an existing line, connect a piece of poly pipe to your system in an area you do not want watered or to repair breaks in a damaged segment of soaker hose or poly pipe. You can srew an end cap on to the 3/4 inch hose threads on the outside of a yellow end and attach the other end to your drip/soaker system to terminate a run. Now available individually or sale priced in bags of 25. Connects to 1/2" compression or 3/4" hose fittings. Also works as a splice if soaker hose is cut or damaged. Now available individually or in bags of 25. When purchased in bag quantities couplings are sale priced at less than half price or 65 cents each.